Los Angeles puts on the glamour after dark, so take this four-hour evening tour to see LA light up for the night! You won't want to miss experiencing the City of Angels by night. You'll visit sights like Walt Disney Concert Hall, Staples Center, and even have an awesome photo opportunity of the Hollywood Sign. Join this one-of-a-kind adventure on the Los Angeles City Tour by Night! L.A. comes alive after sunset like no other city in the world, with stunning twilight vistas and an unmistakable air of mystery and romance. This tour begins in the heart of Hollywood and features four full hours of sightseeing enjoyment. You'll visit the newly revitalized and better than ever, Downtown LA. Los Angeles truly shines at night. 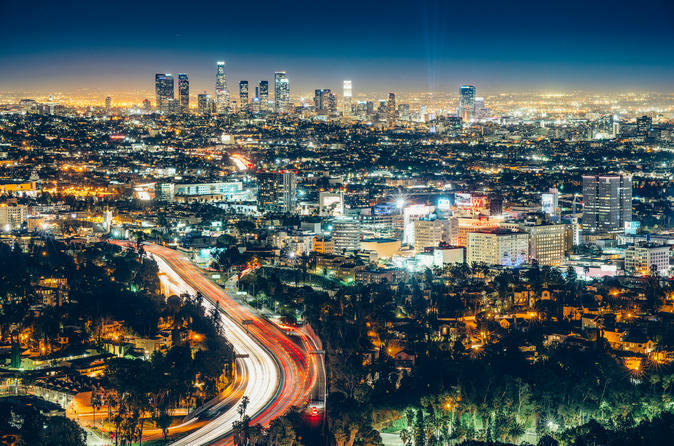 Enjoy famous sights including the Staples Center, Microsoft Theater, Walt Disney Concert Hall, and some of Southern California's oldest neighborhoods. Head to the summit of Griffith Park for a beautiful panoramic view of the city at the spot where key scenes in the classic James Dean movie Rebel Without a Cause were shot. Home to the legendary nightclubs and music venues, West Hollywood's Sunset Strip is the center of the action, every night of the week. Finally, you'll get to bask in the luxury and opulence of Beverly Hills, where you'll find some of the world's most stylish boutiques and beautiful mansions. This tour also includes a visit to The Grove/Farmers Market, Century City's Avenue of the Stars, the Hollywood Walk of Fame, and much more. During the high season, you'll also have an incredible photo opportunity at the world-famous Hollywood Sign.